To-date I’ve done a total of five. The first one was for six days. I juiced all my own fruits and veggies from my parents house the week before I left for the road trip. It wasn’t super hard but it also wasn’t the easiest thing. I was hungry often and actually cheated a few days, sneaking a handful of cashews here and there. I think that actually made me feel even more hungry than if I hadn’t! I chose to give it a go the first time after being inspired by the documentary Fat, Sick, and Nearly Dead. Despite the occasional cashew, I managed to stick with it and used a handful of the recipes from the website that accompanies the documentary. It was actually pretty neat because my skin cleared up and I lost a few pounds. Though, I wasn’t going for weight loss at all, just a healthy change up. 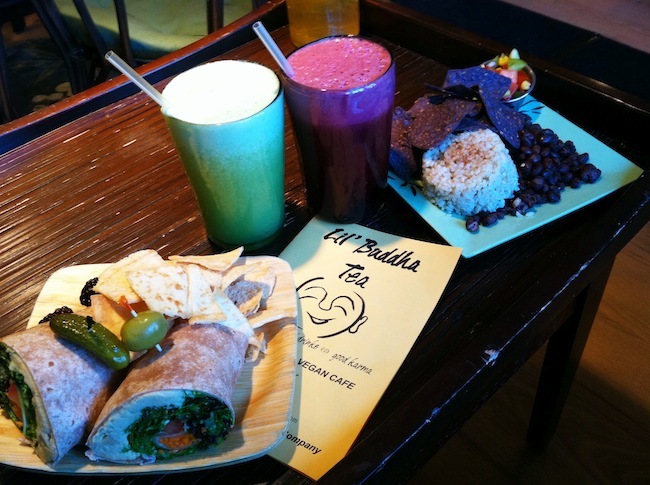 When I had my first meal after the first time cleansing I went with a hummus wrap from one of my favorite vegan establishments in Albany, NY – Lil’ Buddha. Their freshly pressed juice, by the way… OMGorsh.. seriously… how they get that foam on top I don’t know, but it’s so friggin’ good!!!!!!! So yeah, up there.. that wrap on the left. 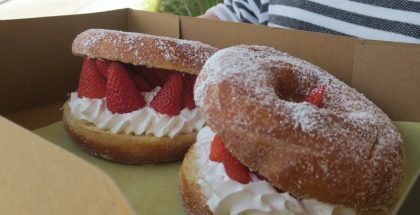 That was the one I had for my first meal back from my first juice cleanse. I got through half of a half because my stomach needed to readjust to whole meals again. Oh man.. I seriously want that wrap right now. So good. The second time I cleansed was with my friend Eric. We hunkered down in Chattanooga, TN where he was living at the time – and where I happened to land during that leg of the road trip. We went in with a positive outlook but by day three we were both irritable, didn’t want to clean the juicer when it was our respective turns, and didn’t feel like buying a bunch of fresh fruits and veggies yet another day in a row… we were bad influences on each other in terms of positivity (or lack thereof), we didn’t even make it a full three days. I think we went out for tacos – or no wait, Chinese maybe – or something by lunch time on the second day. And felt terribly sick after of course because you shouldn’t eat like crud after eating so healthfully!! I don’t know. Haha.. that was a total flop though. Granted, it probably didn’t help that I was writing/blogging about food while not allowing myself to consume any. So. There was that. The third go of it was a short cleanse when I arrived back at my parent’s house after the driving portion of the road trip had concluded (~18 months!). Once again, I snuck some raw cashews (they’re so good!!). 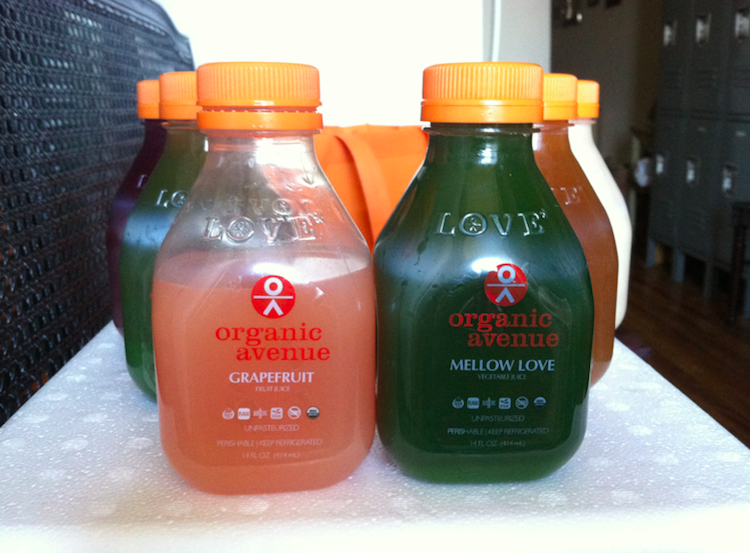 Round four took place in NYC last summer when I first purchased a three-day cleanse from Organic Avenue (OA) and then a friend put me in touch with a really cool local-to-NYC company called Luli Tonix (love the name!). 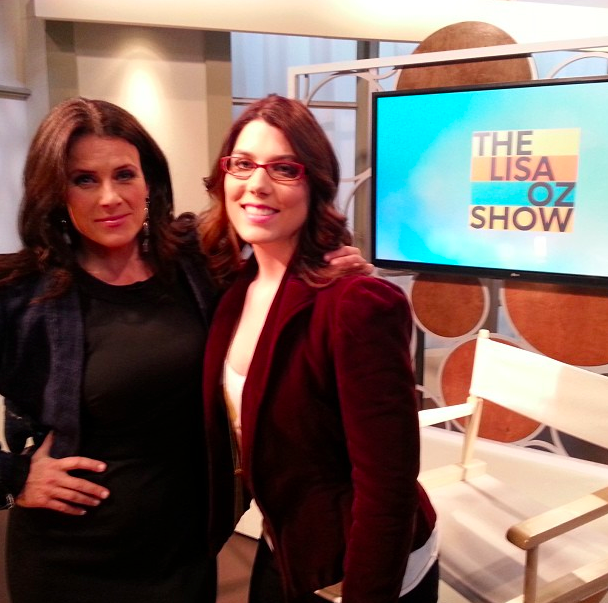 I did those two cleanses back-to-back, so it was six days worth, in preparation for my first-ever national TV appearance on The Lisa Oz Show (set to air this April, 2014)!! I wanted to be the best representation of “vegan” possible. So, a cleanse was in order! 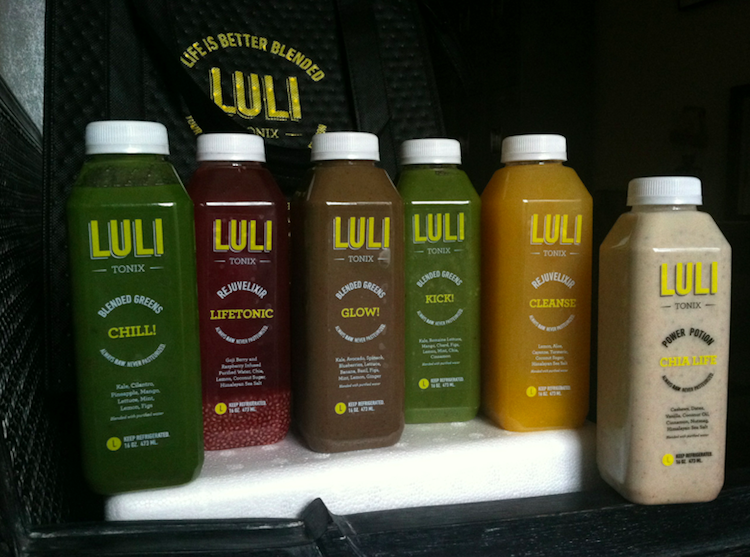 I felt great too and I must say that the Luli’s juices were much tastier than the OA ones, IMO. Did you know that you’re actually supposed to chew your juice when cleansing? Yeah, I guess it helps your body register that you’re eating something and then it better readies to absorb all the good stuff from the juices. Kinda neat. Aaaaaand finally, my most recent cleanse was about three weeks ago. Big ‘ol thank-you and props to Skinny Limits for sending me a three day cleanse that was one of the most delicious cleanses I’ve tried. I’m not sure if it was my half hearted earlier attempts or my desire to just want to get “clean,” but this was by far one of the easiest and most delicious cleanses I’ve done. I never once felt hungry (didn’t even eat ONE cashew! ), I made sure to keep up with full glasses of water between each juice, I poo’d a LOT more than I did with any of the previous cleanses (yes, that’s a good thing), and I felt pretty darn good by the end. I actually wish I had signed up for a longer one because I think by day three my body was just finally pushing out the worst of the toxins that had built up. So another day or two probably would have been perfect. Skinny Limits labeled each juice according to day, and order in which it should be taken. 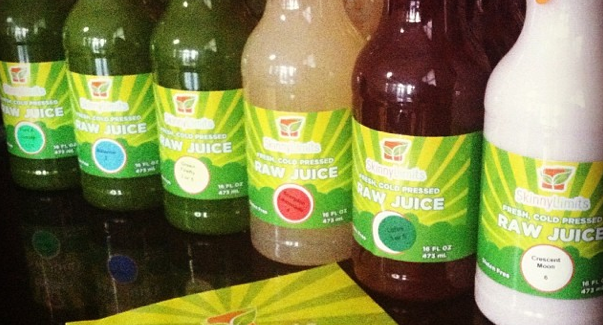 I opted for the Variety Juice Cleanse because I was drawn to the beet juice and the cashew nut milk one (so yummy). The nice thing about Skinny Limits is they deliver all over the country (I believe) so you can order and they send it to you in this big cold pack thing. If you’re like me you’ll find it rather exciting to see all of the bottles of juice neatly lined up in the refrigerator. Hehe! And then you get a little surge of excitement every time you finish a day’s worth. Maybe. I mean.. you might. I wouldn’t know though. Ah’em. 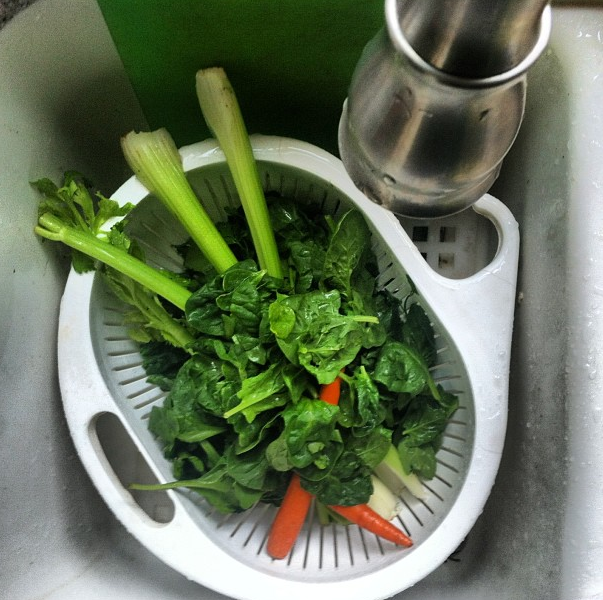 So tell me – have you ever juice cleansed? For how long? How did it go? Best/worst parts? 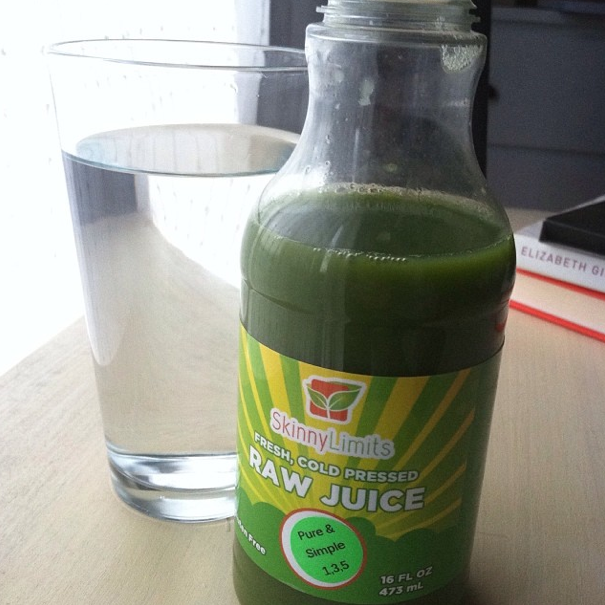 I did my first (and last) juice fast in November 2013. 4 days long. It was thee hardest thing I’ve ever done in my life. I’m the kimd of person who eats immediately when I wake up and like 5 more times throughout the day. I have a fast metabolism. So not eating was the weirdest thing ever and although I did it for 4 days I definitely cheated here and there with an apple or nuts at nighg. It’s impossible for me to sleep hungry. Cleanses are not for weak! Props to you. Chewing your juice makes so mucj sense. I want to give it another go soon. I’ll chew this time :) Thanks for the awesome blog Kristin! what a coincidence! 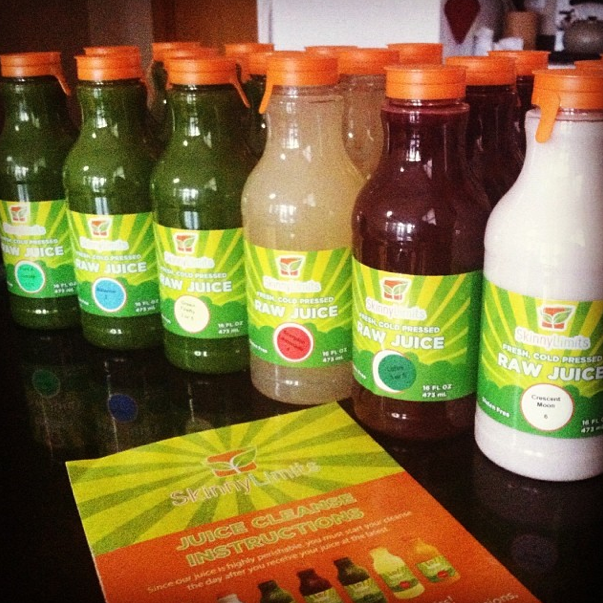 i’m on day one, right now!, of a three day juice cleanse. 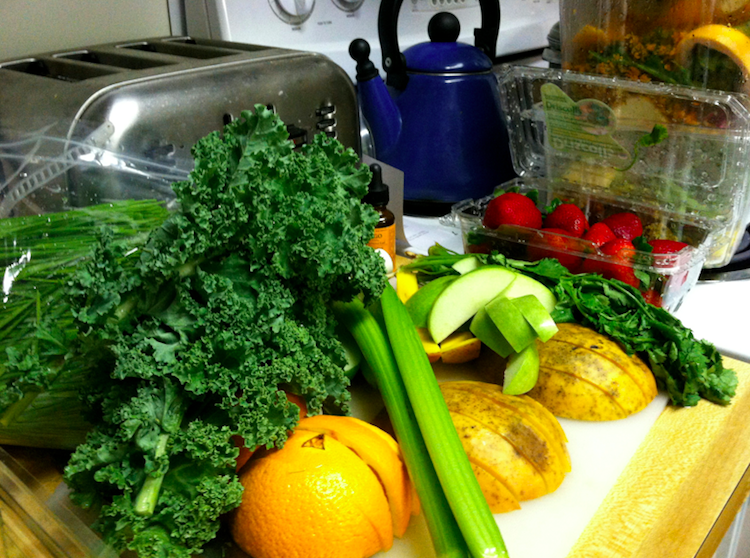 i’ve never done a juice cleanse before, i have eaten raw for 30 days, so i’m excited about this cleanse. 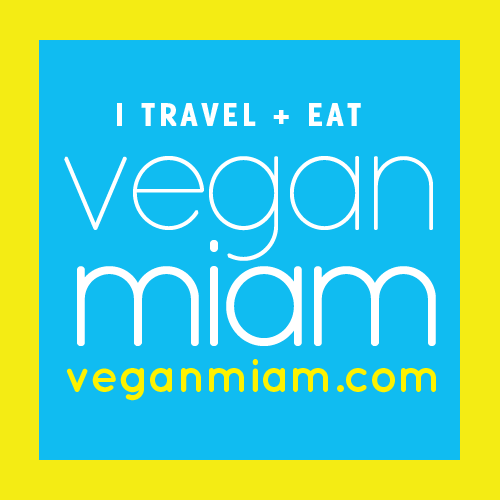 i’m from charlotte nc, and i’m doing a local cleanse through Viva Raw Charlotte! I’ve never been brave enough for a juice fast. The hubby and I used to juice for breakfast everyday, though, and that was nice. Once we have jobs again, we plan on doing that. It’s an expensive habit, thought!